Churning of Ocean or Samudra Manthan mentioned in the Hindu Puranas is an important event that was performed by Devas (demigods) and Asuras (Demons) to obtain Amrit (Elixir of life). The popular belief is that the churning of ocean (palazhi) was done to get Amrit so that it will return youth to the ageing Devas and they will be free from death. There is also a hidden symbolic meaning in the whole exercise of Samudra Manthan. Manthra Mountain was used as the churn and Snake Vasuki was used as the rope. To hold the churn, Lord Vishnu took the incarnation of Kurma or Tortoise. 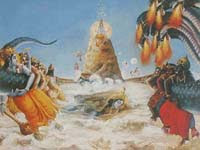 The poison that came out during the churning was consumed by Lord Shiva. The ageing process of Devas symbolically suggests the pollution of the mind. The mind gets covered with all impurities and this hides the Supreme Truth. The mind becomes easily corrupt and is under the sway of materialistic needs and desires. It becomes the seat of ignorance. The escape from death is Moksha and this has to be attained on this earth through self realization. The impurities of the mind can only be cleared by knowledge. This knowledge can only be obtained by the churning of the intelligence. For this the brain needs to expand like the huge snake Vasuki and the mind should be courageous and all inclusive like the huge Manthra Mountain. The kurma or tortoise symbolically indicates that the Amrut of Knowledge can be only obtained when we have the capability to control the senses. We should be able to pull back our senses from the materialistic world when causes impediments in the path of self realization. When this whole process is taking place, numerous forces will try to pollute our mind. We should learn to fight these evil tendencies just like Lord Shiva – who drank the Kalakuta poison.